Are the decisions we make no different than what everyone else would make? If all we’re looking for is average, then that’s fine. The problem is average is just that — average. It doesn’t get you anywhere. Are you guilty of not thinking things through in a contrarian manner? I think we all can significantly up our game if we begin looking at things in this way. One of the best examples of the need for contrarian thinking can be seen by remembering how 10 years ago everyone was talking about “peak oil.” Conventional thinking held that the world was quickly running out of oil. Clearly that didn’t happen, as technology uncovered massive oil reserves in many places once thought to hold little potential. This is a great example how contrarian thinking overtook conventional thinking. Contrarian thinking allows us to unlock new opportunities and to see potential where others don’t see anything. We all live in a bubble. It’s just a degree as to how big our bubble is. The smaller the bubble, the less we’ll see in terms of opportunities. Marc Andreessen without a doubt lives in a big bubble driven by his contrarian thinking. How much bigger could you make your bubble if you viewed more things in a contrarian manner? How much more successful would you be as a salesperson if you viewed yourself as a contrarian salesperson? 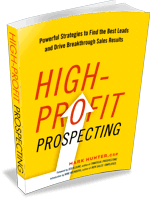 PrevPreviousWhere are Your Leads Coming From? Great insight. Having worked in business development for a dozen years with thousands of different kinds of people, it is almost always an advantage to be the sales representative who is willing to challenge the prospect’s way of thinking.